Two stroke bikes are bad for the environment, but good for the fun-vironment. 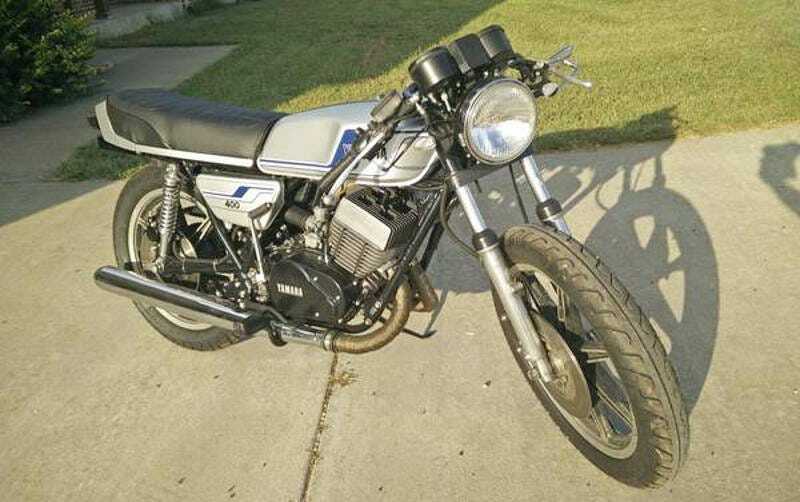 Today’s Nice Price or Crack Pipe RD400 might be a bit dirty, but will this restored bike’s price prove a low down dirty shame? While many of you wanted to be sitting by the Doka the bay, fully 83% of you felt that yesterday’s 1988 VW Double Cab’s twenty-seven grand price was worthy of standing up for what’s right and voting Crack Pipe. Since we’ve already ascertained that you don’t like pricey VWs, let’s now see if you have a love/hate relationship with two-stroke bikes. Here in the U.S. we don’t get much opportunity to hear the staccato cackle of two-wheel two-strokes, as they have been pretty much regulated out of existence owing to their overtly environmentally unfriendly nature. Nowadays the only two-strokes you’ll hear in suburban neighborhoods are the weed wackers, leaf blowers, and chain saws of gardener crews. That wasn’t always the case, and as this 1978 Yamaha RD400 proves, two-stroke bikes not only once existed, they were pretty cool too. Two strokes were cheap to build and relatively easy to maintain, and as a primary benefit they could offer big bike power in a little bike package. The RD400 twin was derived from the RD350, which itself was loosely based on the company’s racers of the time. The engines were unique in that they had a secondary port in the intake manifold which added extra fuel/air to aid in the combustion chamber’s fill, and also to serve to cool the piston crown. That, along with a strong crank support, gave the RD400 a wide power band and a claimed 40-horsepower at 7000 rpm. That power and rev range is readily apparent to the ears as the RDs sound like little else. Yamaha fiddled with The 398-cc twin to make it less raucous sounding than its 350 predecessor, but these bikes still arrive like a hive of jacked-up honey bees screaming for vengeance. These are almost modern bikes. A six-speed gearbox puts the power down, and cast alloy wheels support disc brakes at each end. The RD was the first production bike to offer these sort of wheels. These bikes also had an auto-lube pump for the two-stroke engine, but the seller says that it’s been removed here. Traditionally, two-strokes ran on premix, a combination of gas and oil, that worked both as fuel and lube. That worked okay at certain revs, but not at others, often proving too oil-heavy at low RPMs which led to fouled plugs and gunked up mufflers. The auto lube pump fixed this problem by eliminating premix. Instead, an oil tank fed the pump which then metered the right amount of oil depending on engine speed. This one runs on premix and probably needs to be wrung out after any length of time it’s stuck in traffic. Of course, it’s a motorcycle so it’s not likely to get stuck in traffic. As an aside, the seller says the disembodied pump comes with the bike and can be reinstalled. Those carbs have been rebuilt as have the forks. The shocks are also new, but are wrong for the bike, which only matters if originality is a concern. If it is then you might want to re-attach the front fender and turn indicators too, which the seller says he has but that they are a little grodie. Dropped bars make the bike look like a dog that’s done something really, really bad. The ad notes that the present owner is willing to trade the bike for another, or to sell it outright for cash. The price for that second option is $3,250 and it’s now incumbent upon you to decide if it’s worth that. What do you think, is that $3,250 a deal to get Yamahoppin’? Or, is this classic two stroke just too expensive as it sits? St Louis Craigslist, or go here if the ad disappears.